Forget about the fact that you lost a tooth! You can have a new one which looks and acts like a natural one. Plus, with the appropriate care it will last a lifetime. We know from our patients that a person’s trust in his/her teeth and smile appearance has an impact on the way he sees himself/herself both professionally and personally. Often someone hides his smile trying to mask the missing tooth’s gaps. In this situation a person can’t chew appropriately and in time the dental configuration will modify because of the teeth’s found in the immediate proximity of the gap displacement. For all those who want to once more confidently smile, talk without looking at the ground or covering their mouth there is the possibility of inserting implants in the bone. Dental crowns, identical with the natural teeth and which well groomed can last a lifetime, are placed. 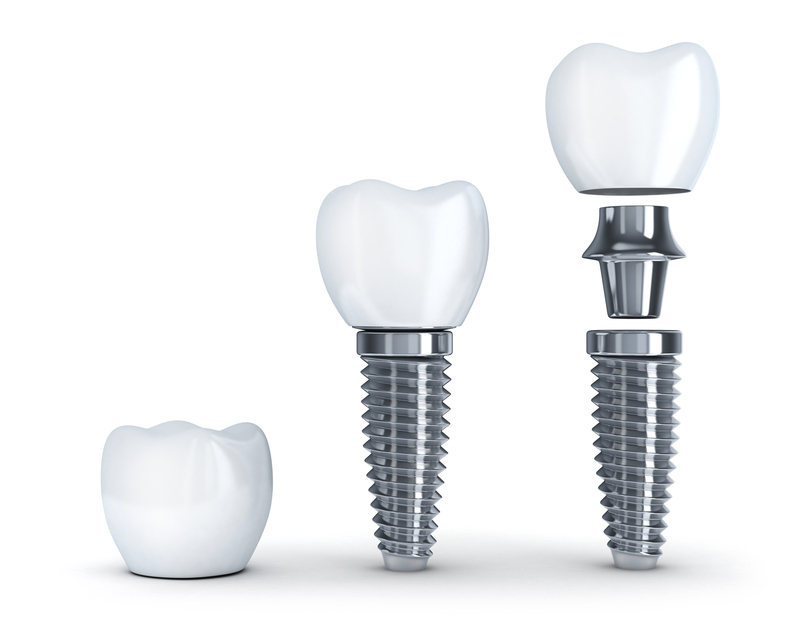 The implant is a metal – synthetic tooth root substitute placed on the bone of the superior or inferior arcade. It is also used to replace a tooth which can no longer be recuperated, or to create a support item for a dental bridge when it can’t be natural done. In this situation, because it doesn’t need processing to sustain surrounding teeth, the item is a more suitable support item. It is the optimal solution in dental reconstruction necessary in covering the consequences of Periodontal disease, an accident or any other situation. The implant is inserted into the bone and left there for 3 to 6 months while the bone readjusts. After this the dental crown is placed over the implant. This treatment’s main advantage is that it leaves the surrounding teeth untouched. It offers solutions for bone substance loss prevention. The comfort offered by implant treatment is superior to that of various prosthesis. It is the most modern and efficient treatment solution. We recommend implants because they are a life long immobile alternative for missing teeth. Due to the fact they look and act like real ones, plant restorations are the closest thing to natural teeth. Future infection risk is reduced thanks to the fact they are incorporated in the bone structure. To most people they are unnoticeable. Masticator efficiency is increased. The dental implant will allow you to once more comfortably talk and eat. It will get you rid off the noises and movements produced by classic teething. It has the greatest success percentage. Dental implant has a very high success rate, representing the optimal solution for missing teeth replacement. …for sinus-lift by lifting the maxillary membrane in order to get a sufficiently big bone height to apply implants. Do you want to know more about the beauty of your smile?